This July, London will host The Art Conference (TAC), bringing together a programme of international keynote speakers from the worlds of technology, art and culture. TAC is founded by contemporary art curator Tina Ziegler in partnership with The IWSC Group. Bermondsey’s The Ugly Duck, a three-storey 19th century warehouse, will be filled with film screenings, panel discussions, exhibitions and digital art installations. The exhibition hall will be transformed into a maze of mini-solo exhibitions, virtual reality experiences and digital art installations from both local and international artists. 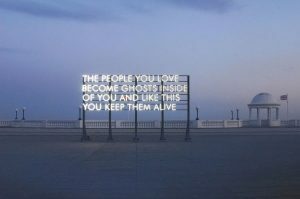 World renowned light artist and poet Robert Montgomery displays his much-loved light installations. Colin McMaster shows a collection of original acrylic and hand-cut wood paintings while artist Jordan Seiler exhibits his Public Ad Campaign work where visitors can test how the artworks transform when viewed through an iPhone. Jose Montemayor presents Virtual Awakening, an immersive, life-after-death virtual reality experience. I have always wanted to encourage dialogue, critical reflection and interaction with arts and technology, striving to bring people together to connect with the arts and help break down the boundaries people often find when engaging with art. TAC will offer a series of curated, thoughtful and interconnecting presentations by representatives from the wider art world – curators, artists, collectors and art administrators. My aim is that TAC will allow the worlds of art and technology to meet and inspire each other. The IWSC group – which already manages a significant portfolio of acclaimed social events – will be lending its unique talents and experience to TAC, bringing a fresh perspective to the art conference scene. Visitors will also be treated to food and drink from local chefs in the outdoor food court, while networking breakfasts and afternoon teas will be provided by Unity Kitchen, a social enterprise that helps to create jobs and apprenticeships for people with disabilities. TAC aims to create valuable digital content and interaction with the art and creative community through digital sharing. Using platforms like Facebook and YouTube, TAC will generate an online following and create a digital version of its conference. The conference will present a curated selection of more than 15 international keynote speakers. Each of the speakers share their unique stories and experiences and offer practical insights into the art and creative industries. Witz is currently based in Brooklyn, New York. Witz’s extraordinary, off-kilter street art has won numerous accolades and grants, exhibited in galleries and museums worldwide. His work has been exhibited in galleries and museums worldwide including the Museum of Modern Art in New York and the Indianapolis Museum of Art. In 2010, Gingko Press released In Plain View, a monograph documenting 30 years of Witz’s career of works created in the studio and on the street. Rushmore has been exploring contemporary art as a writer, curator, photographer, arts administrator, critic, and fan since 2008, focusing on the transformative potential of art in public space. He is Editor-in-Chief of the street art blog Vandalog. He has written two books concerning street art and graffiti respectively, and spent two year’s as co-curator of The L.I.S.A. Project NYC, a mural program in Lower Manhattan. Jensen is a creative director, artist, artist liaison, producer and project manager, and is the founder of Spaying Bricks, a network of emerging and established street and graffiti artists from across the globe. Seiler is a New-York-based artist and activist who, at the beginning of the 2000s, began covering outdoor advertisements with simple patterns or blank soothing images. 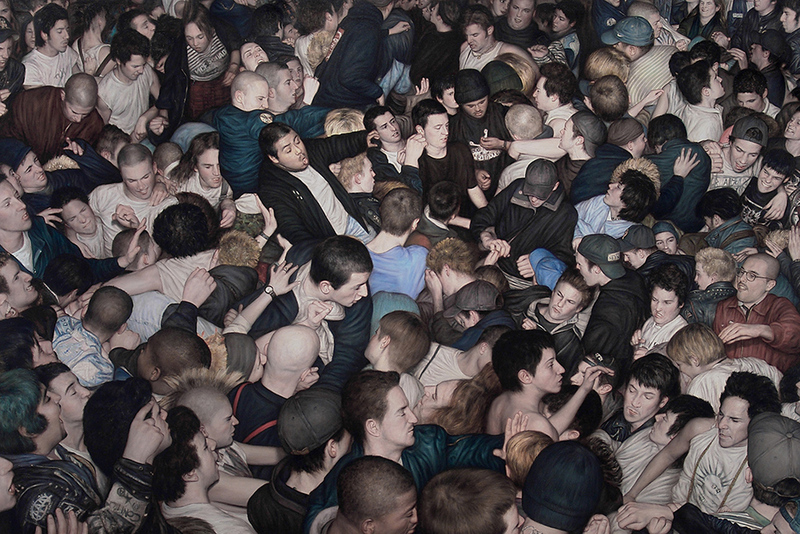 His works quickly developed into a critique of the social effects of advertising on the shared public psyche. 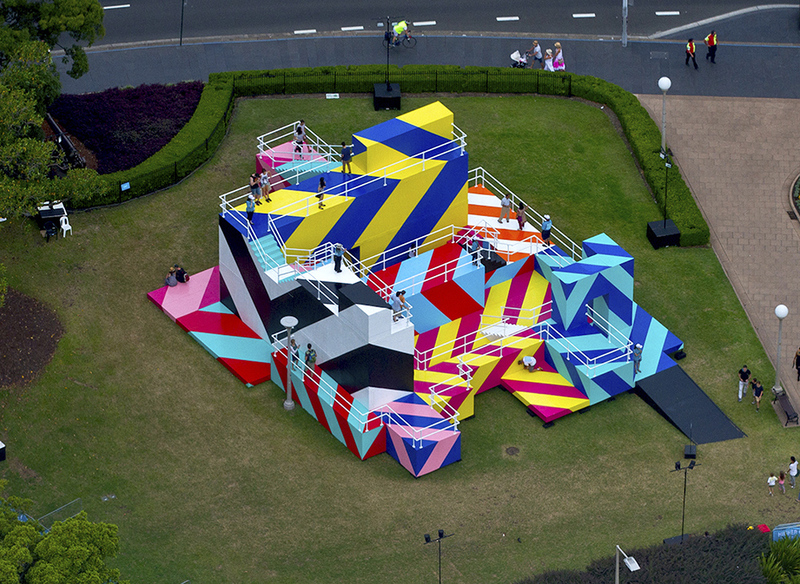 The resulting debut project – Public Ad Campaign – has become a global movement of over 100 street artists. 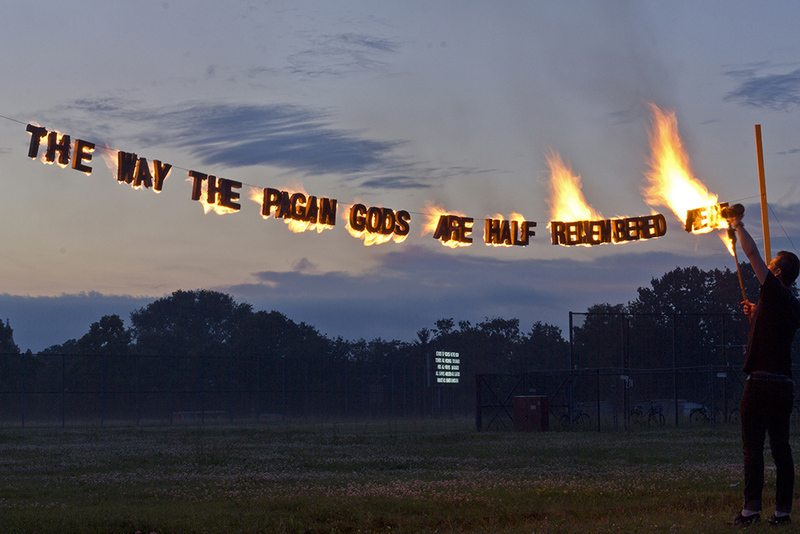 Montgomery is a Scottish-born, London-based sculptor and poet, known for his site-specific installations created from light and text. 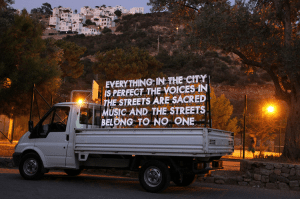 Often installed illegally amid industrial and urban sites, Montgomery’s installations address universal themes such as power, love and kindness with sparse language and dramatic visuals. Hailing from Ireland and residing in the USA, Maser creates large-scale mural work, collaborating with the likes of musician Damien Dempsey, JR, Connor Harrington and Fintan Magee.Most recently he was invited as one of 11 selected artists to produce a film accompanying the songs on U2’s 13th album. 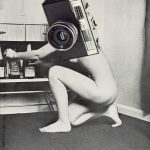 Montemayor is an emerging Mexican photographer and visual artist, recently graduated from London College of Fashion with a masters in fashion photography. His work displays a broad spectrum of styles and subjects including fashion, documentary photography, landscapes, film, art installations, visuals for music and virtual reality experiences. Edwards is a London-based artist and co-founder of A-side B-side Gallery in Hackney Downs. In 2015, her work was selected to be part of Dismaland, Banksy’s ‘bemusement park’ in Weston- Super-Mare, a particular highlight alongside regularly-held exhibitions across the UK, Germany, Austria, Poland and the USA. and internationally renowned gallery space that focuses on Public Art. Trotin was formerly a joint curator of the renowned West Berlin Gallery and the infamous Stattbad Wedding. Swedish journalist Grondahl splits her time between her country of birth and the Middle East. She is the co-founder of Woman on Walls and has played an important role in Egypt to empower women through the use of street art. Lewis is the founder and CEO of Skute. He has built a unique platform of knowledge and real- world experience in every aspect of Digital Media. He has been immersed in its evolution, working alongside many of the greats in the field. Skute aims to create new connections through content unlocked with NFC tags. Fois is an independent curator based in London, responsible for numerous exhibitions in the UK and abroad including Upfor, Portland, 2016; The Other Art Fair, London; and Art15 Global Art Fair, London. In 2010 she founded La Scatola Gallery, London, and her latest academic research on the subject of “prosumerism” has been published by the Electronic Visualisation and the Arts. 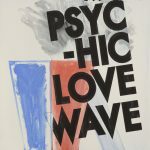 Exhibiting artists Maser, Colin McMaster, Jose Montemayor, Tinsel Edwards, Will Vibes and Robert Montgomery. This entry was posted in NEWS and tagged Dan Lewis, Dan Witz, Guillaume Trotin, Jordan Seiler, Jose Montemayor, Louis Jensen, Maser, Mia Grondahl, RJ Rushmore, Robert Montgomery, The Art Conference, The Ugly Duck, Valentina Fois. Bookmark the permalink.